The country's largest private sector life insurer, ICICI Prudential Life, on Wednesday said it will hire 3,000 people in the next two months, debunking reports of any reduction in workforce. 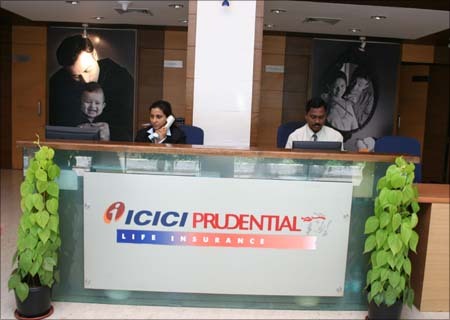 "We are a growing organisation, and we have already started hiring the next round of 3,000 people over the next two months, the process for which is in full swing," insurance company's senior vice president and head-marketing Sujit Ganguli told PTI. The employee strength the insurer stood at 25,000 at the end of March 2009. The insurance company, which has a network of over 2,000 branches, has already rationalised its branch network for optimal utilisation of resources, he added. Image: Employees of ICICI Pru Life at the company's office. Image: Employee of ICICI Pru Life at the company's office. "We have combined some of our branches. We have not vacated from any location (cities, towns and tehsils/taluqas) where we were present and have ensured to remain in close proximity to all our customers," he said. The company added 40 branches to its network in the second half of 2008-09 notwithstanding branch rationalisation exercise, he said, adding that the number of branches have gone up to 2,009 as on March 31, 2009. Net of opening new branches and rationalising, the number of branches has actually increased from 2,055 in September 30, 2008 to 2,099 as on March 31, 2009, he said. Employees from the rationalised branches have been moved to the nearby branches, Ganguli added. 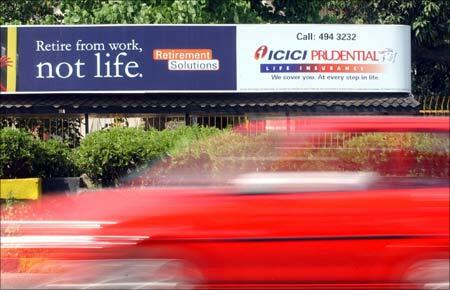 Image: A vehicle passes a life insurance bill board of Prudential-ICICI in Mumbai. Photographs: A vehicle passes a life insurance bill board of Prudential-ICICI in Mumbai. The insurer, which witnessed a 18 per cent decline in the new business during 2008-09 at Rs 6,812.52 crore (Rs 68.125 billion) against Rs 8,305.85 crore (Rs 83.058 billion) in the previous fiscal, did not increased headcount in the last five months. "Since December 2008 we have not undertaken any replacement hiring for the positions (front-line sales force) that have fallen vacant which has resulted in reduction of employee count," said Ganguli. "This also includes about than 2-3 per cent of our staff who have left basis their performance in the last month," he said. During FY'09, the company sold 26,38,238 policies compared to 29,13,606 policies in the previous year. Image: A man walks past the ICICI Bank headquarters in Mumbai. 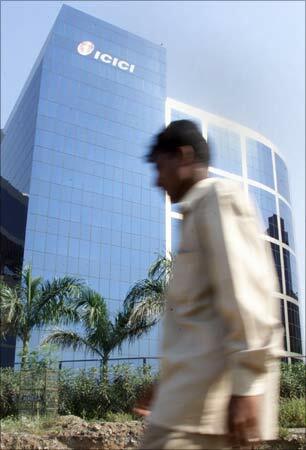 Photographs: A man walks past the ICICI Bank headquarters in Mumbai.